Original sports supplement containing high-grade protein complex. The ideal proportions of proteins rapidly and slowly absorbed not only provide high efficiency, but also versatile protein supplement. 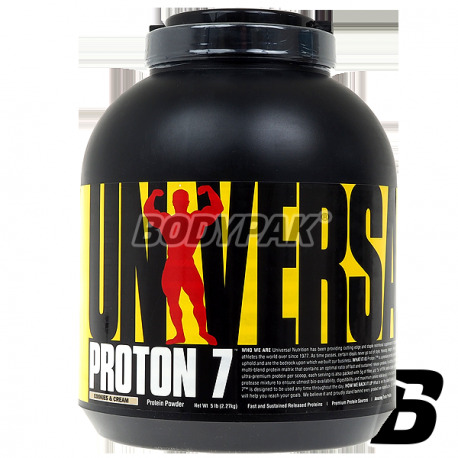 The original dietary supplement Universal Proton 7 is a top class protein supplement powder, better than any other. Excellent composition, taste, solubility - just a class by itself! Proton7 name refers to the 7 kinds of proteins contained in the formula - Proton 7 is a dietary supplement based on a complex blend of protein, containing a mixture of optimal proportions of proteins quickly and long-acting. US Proton 7 formulation is based on the best form of the protein, such as whey protein hydrolyzate WPH, whey protein isolate MIP or micellar casein. Each serving of nutrients to the muscles univeral Proton 7 contains 23g protein, 5g fiber and a portion of healthy fats (5g EFA). The ideal supplement for athletes of mass Proton 7 provides the highest bioavailability, digestibility and maximum amino acid levels in the bloodstream. 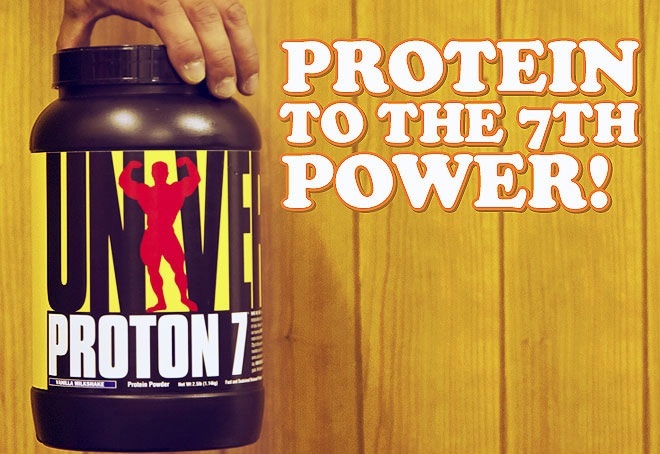 And most importantly, Proton 7 is the perfect protein for the muscles to be used at any time throughout the day. Universal Proton 7 is a modern preparation for advanced athletes, which supplements the diet with high quality protein. 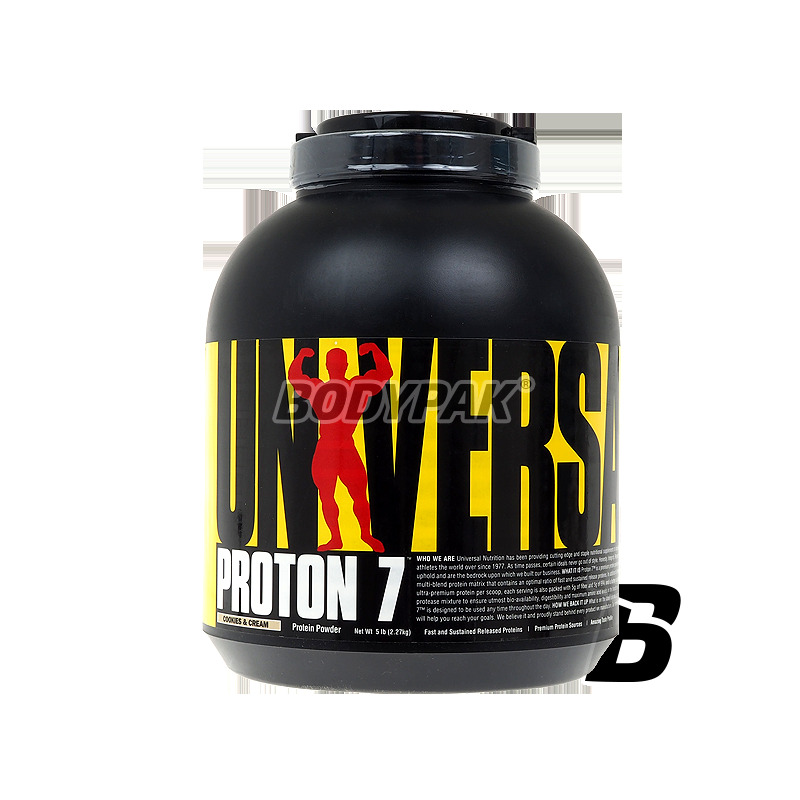 American sports supplement Universal Proton 7 is a unique complex of the seven factions of protein, fiber, healthy fats and complex of vitamins and minerals. Whey protein has the highest BV is a source of protein with the fastest action (release of amino acids into the blood) and it represents the basis for Proton 7. In addition to whey protein składwchodzi casein, a milk protein and egg albumin. These are the fractions of the medium and the rate of sustained operation. With a diverse mix of protein Proton 7 is a universal nutrient for athletes with high efficacy and potency, which can be used in the morning upon waking, at any time during the day, after training and before bedtime. Ingredients: Proton 7 mixture of proteins [ultrafiltered whey protein concentrate (milk), milk protein concentrate, calcium caseinate, micellar casein, hydrolyzed whey protein, whey protein isolate, albumin egg] Proton 7 of fiber and a blend of enzymes (polydextrose, inulin, bromelain, papain) Proton 7 EFA Matrix [sunflower oil, MTC powder], maltodextrins, cocoa, natural and artificial flavors, corn syrup, soy lecithin, sodium caseinate, Proton 7 Colloid Blend (cellulose gum. xanthan gum, carrageenan), sodium chloride, acesulfame K, monoglycerides, dipotassium phosphate, tocopherols, silicon dioxide, sucralose.